Most reporting is based on reviewing current and recent performance, but managers and boards also want to know what is likely to happen in the future in order to plan strategy or take corrective action as soon as possible. Analytics cannot predict all the external shocks to a system, but they can do a good job on anticipating future performance based on previous patterns of behaviour. Predictive analytics extracts information from historic data and uses them to predict trends and behaviour patterns. The core of predictive analytics relies on capturing relationships between explanatory variables and the predicted variables from past occurrences, and exploiting them to predict the unknown outcome. It is important to note, however, that the accuracy and usability of results will depend greatly on the amount of previous data, the depth of data analysis and the quality of assumptions. We tend to use the R language to run linear and logistic regression and time series models. This example shows the sales 'glide path' we have developed and is similar to work we have done with a leading UK car manufacturer. We carry out detailed regression analysis on historical sales periods to understand which factors affect the volume of sales within a month; for example, this could include weekend or bank holiday effects. The blue line shows the predicted daily sales volumes that should be achieved in order to meet a pre-defined target volume by the end of the sales period. 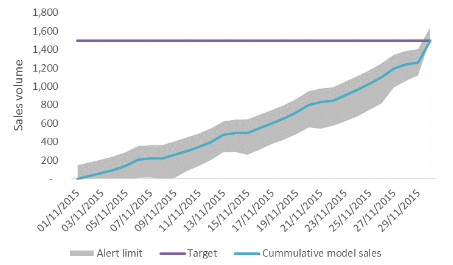 In-month sales tracking within the grey 'glide path' are therefore likely to meet their end-of-month target according to our model. In this screen shot, we show an example from work we have done for a housing association. They wanted to know whether to worry about a KPI that was far above the current target value. Our predictive work (the light blue line) showed that the KPI was likely to come into the target range by the end of the financial year, and so avoiding unnecessary corrective action.